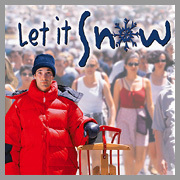 An official selection for the 2000 Sundance Film Festival, Let It Snow is a comedy with "issues". The family curse promises that “the men leave and the women go crazy” but when 18-year old James meets Sarah on a magical New England snow day, they are linked for life. Written and starring Kipp Marcus and directed by his brother Adam Marcus (Jason Goes to Hell: The Final Friday), Let It Snow also starred Golden Globe and two-time Tony winner Bernadette Peters, Henry Simmons (“NYPD Blue”), veteran character actors Larry Pine and Judith Malina, and, in one of his earliest film cameos, a young Stephen Colbert. Let It Snow won the Best Writing and Best Editing Awards at AFI's Los Angeles International Film Festival and was an official selection at the Deauville, Raindance (London), Fort Lauderdale International, and Avignon New York Film Festivals.